A collection of short fiction about climate chaos and its aftermath, exploring a variety of possible futures for humans and the Earth, ranging across genres from science fiction and fantasy to literary fiction and prose poetry. 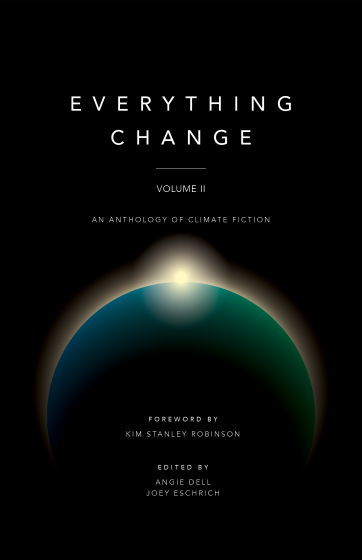 It features a foreword from renowned science fiction author Kim Stanley Robinson, along with 10 stories from Arizona State University's 2018 Everything Change Climate Fiction Contest. The contest and anthology are presented by the Imagination and Climate Futures Initiative at Arizona State University, which is a partnership of the Center for Science and the Imagination and the Virginia G. Piper Center for Creative Writing. Angie Dell is the associate director of the Virginia G. Piper Center for Creative Writing at Arizona State University, and a writer, editor, letterpress printer and book artist. She is also on the board of the NonfictioNOW conference, and she owns and runs Shut Eye Press. She earned a Master of Fine Arts in creative writing at ASU in 2013. Joey Eschrich is editor and program manager at Arizona State University's Center for Science and the Imagination. He's also assistant director for Future Tense, a partnership of ASU, Slate and New America. Eschrich earned a bachelor's in film and media studies (2008) and master's in gender studies (2011) at ASU.